Even with diet and exercise, most people have stubborn pockets of fat that seem impossible to lose. SculpSure’s body contouring technology is able to target and reduce these fat cells without affecting the skin’s surface, without surgery or downtime. SculpSure is a non-surgical, 25-minute procedure which uses light-based technology to reduce up to 24% of fat cells in the abdomen and flanks. Over time, these damaged fat cells are naturally absorbed and decreased in the body, with results seen as quickly as six weeks, and optimal results typically seen at 12 weeks. SculpSure is ideal for people with stubborn fat that seem resistant to diet and exercise. Every patient is different so the team at Solutions Laser Studio will work with you to develop a customized treatment plan to help you achieve your goals. SculpSure is a non-surgical body contouring procedure. During treatment, most patients feel a tingling sensation intermittently which is generally well-tolerated. During the SculpSure treatment, fat cells are affected and will not regenerate. Patients may start to see results as early as 6 weeks following treatment as the body begins to evacuate the fat cells, with optimal results usually seen at 12 weeks. There is no downtime with SculpSure so you can have the treatment during your lunch hour and return to work immediately. What is the difference between fat loss and weight loss? The number of fat cells stored in our bodies typically remain constant throughout adult life. As we lose weight, the size of fat cells become smaller, but typically do not decrease in number. Even with diet and exercise, many people have difficulty losing weight in these trouble areas. After the SculpSure treatment, the fat cells will not return. 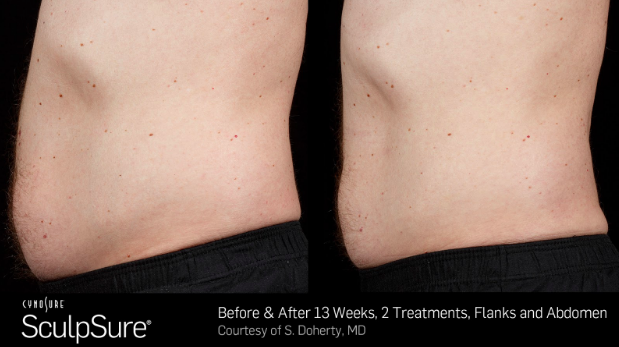 With the help of SculpSure, achieving a slimmer, more sculpted appearance is possible, even in those troublesome areas. Please call us at 630-470-9930 to schedule a complimentary consultation and learn more about your customized SculpSure treatment.